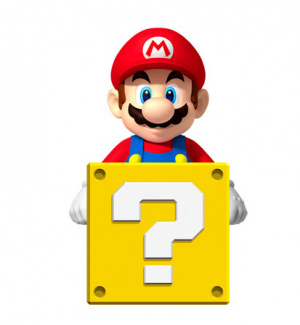 Desperate to spend your Club Nintendo coins but just don't know what to spend them on? Let Nintendo help you out, with a series of Mario "Surprise Me" boxes for 300 coins. 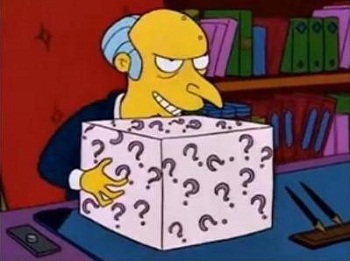 The box contents are secret, but Nintendo claim you'll get at least two surprises with a combined worth of over 500 coins. While the website shows the mystery boxes in classic ? Mark blocks, they'll turn up at your door in standard postal packaging, which is a little disappointing. Oh, and items may not be returned, so make sure you'll be happy accepting something unknown before you shell out. Don't forget that next week sees Club Nintendo updated with new games to download, in case you feel like saving your coins. Maybe I'm just being an idiot, but I can't seem to find this on their North American site. The prizes were taken down a few hours after they went up yesterday (North America CN). Maybe it was only a very limited time offer? Hope we get game downloads for Nintendo Stars in the UK soon. I know we can get Nintendo Points but it costs 800 stars to get one 200 point game, and they're not even compatible with the eShop! I might want to give this a try after I see what other people get of course. @Linkstrikesback Given that it says "club.nintendo.com", I assumed that it would just take me to the CN homepage. But thanks. Aaaand it doesn't matter, since it's currently unavailable. I'm definitely tempted. I have 700 coins right now. But I would like to know what I'm getting into. We need some guinea pigs to find out what each of the 6 varieties contain. Will this just be two random prizes from what they already have available? Or two completely unknown items? I'm guessing the former. It's probably the soundtrack they forgot to put with Other M.
I need to get one of those as soon as I get 150 more coins. This offer is over, it was a super limited time thing. By the time I found out which was about 13 hrs ago the offer was already over (they were all sold out). Readers should be informed of this. The link works for me, but then I'm not a US CN member. Apologies if they're already gone! @James It's not the the link doesn't work it's just that they are all gone. I'd like to get that Golden Nunchuk Japan got. It would be nice to know what the range of these prizes are, as I would be willing to shell out 300 coins for a chance at the replica Game & Watch console. EDIT: After a bit of looking, it doesn't seem like the prize is accessible from the Rewards Catalog, which concerns me that it might just be a test page. I'll wait for something more solid before I start dumping my coins in anyone's bucket. @James The link works fine, they're just not offering it at the moment. “? Block” Sound Cube came in the UK one again which I got in September 2010 but I really want this one that is mentioned here. That was over FAST. I wonder if they're just preparing to do it. I've got some coins that are about to expire so I may try this. Ahh can't resist! Must try! I'll try it and see what i get. Aww. It appears I missed it. I was going to chance it. Man, I was gonna get it. Dammit Nintendo. Sounds a bit like gambling. You don't know what you will receive! Fun for people who love a bit of risk. I probably just keep turning stars into nintendo-points, so I can download VC games! Update: Oh, they talk about coins in the article, so it must be America-only. I've already bought everything I like from North America's crummy catalog, so why would I waste my crummy coins to be surprised with stuff I already have or have never wanted? This is a funny way to deliver the stocked product. don't do it, its nothing but ET Atari 2600 games and dirt! ITS A TRAP! Definitely will do when I have nothing else better to do with my coins. Eh, its too risky. I'd rather save towards something I know I want. I'm also still hoping KI boosters will show up. "The boxes are full of Superman 64 don't get them!" "don't do it, its nothing but ET Atari 2600 games and dirt! ITS A TRAP!" I'm pretty upset with club nintendo right now, they've been "preparing my order" for six days... I've never ordered anything from them until the mystery box. Can anybody tell me if they usually take this long?